This is the seventh time that the VDA has initiated a German pavilion here at the Auto Expo in New Delhi with the slogan “Made in Germany.” The pavilion is supported through the official foreign trade show program by the German Federal Ministry for Economic Affairs and Energy and AUMA, the Association of the German Trade Fair Industry. It is being realized by the trade show organizer IMAG. Commenting on the growing interest of German companies in India, Braunig said, “India is on a path of growth. With the growing GDP and industrial production combined with falling inflation rate, there is a considerable potential in this large country with just over 1.3 billion people. The population is young – more than half of all Indian citizens (54 percent) are under 30, and only 6 percent are over the age of 64. The per capita gross domestic product has also shown a positive trend during recent years, with annual increases of between 6 and 7 percent”. “In 2018 the Indian passenger car market will overtake the German market in terms of volume for the first time. In the period from 2014 to 2017 this market grew by a good quarter (+26 percent) to 3.2 million new cars. In our forecast we assume that in the current year the Indian passenger car market will expand by 10 percent – to a volume of almost 3.6 million units. This means that for the first time the India passenger car market will overtake the German car market in terms of volume. And the potential has not yet been exhausted – not by a long way. The number of passenger cars here is still low by international comparison. At present India has 24 passenger cars for every 1,000 inhabitants, while Germany has 560 passenger cars for every 1,000 inhabitants”, he added. A strong representation of the German automotive industry with major suppliers alongwith newcomers can be seen at the Expo which is supported by the Federal Government and the IGCC (Indo-German Chamber of Commerce). We are proud of our close cooperation and of the fact that we take part in each other’s motor shows. For example, the ACMA, the Automotive Component Manufacturers Association of India, will again have an Indian pavilion at the IAA Commercial Vehicles in Hannover in September. On the official German pavilion – which is promoted by the German Government – we have 10 suppliers. Then there are also about 20 more German suppliers here, some of whom are exhibiting at the Auto Expo with their Indian subsidiaries and partners. German passenger car makers are also exhibiting at the “Auto Expo 2018 – The Motor Show” that is taking place almost simultaneously in Noida. The German car makers have their own production facilities in India. For example, Audi builds its A3, A4, A6, Q3, Q5 and Q7 models at its plant in Aurangabad. The VW Passat, the VW Tiguan and Skoda’s Octavia, Superb and Kodiaq models are also produced there. Since 2007, the BMW Group has had its own plant in Chennai on India’s south-east coast, where it builds its 3, 5, 6 and 7-Series, and the SUV models X1, X3 and X5 from CKD kits. Daimler has a passenger car factory in Pune making the C, CLA, E and S-Classes, along with the SUV models GLA, GLC, GLE and GLS. In the same region, the Volkswagen plant in Chakan near Pune builds VW’s Ameo and Polo models and the Skoda Rapid. 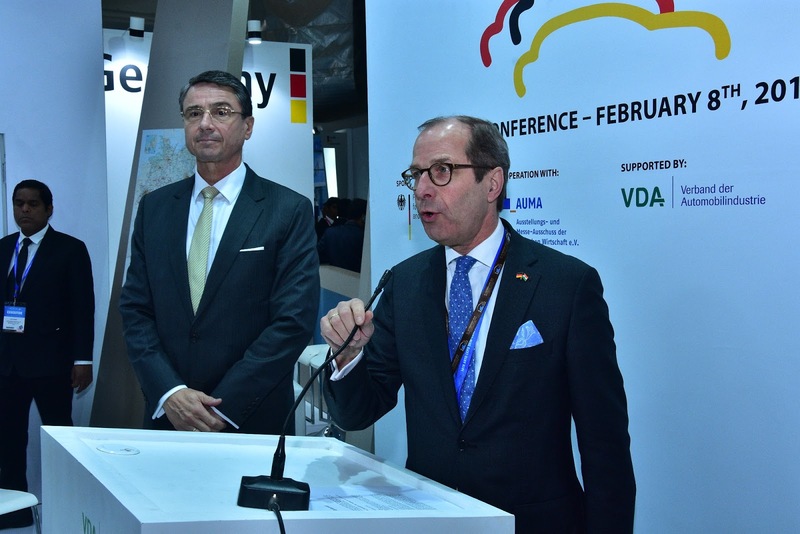 We are delighted by the German commitment at both of these trade fairs here in New Delhi. We very much support a trade show concept bringing manufacturers and suppliers together again on a single exhibition site. We think that the division of the motor show in New Delhi – with the suppliers here in Pragati Maidan, and the vehicle makers there in Greater Noida – is not the best solution. In particular our many suppliers in the VDA are expressing their keen desire for the opportunity to present their innovations together with the OEMs in the future at a single trade fair. And in the view of the VDA this would make sense, because OEMs and suppliers can only drive forward the future of mobility if they are in development partnerships. We believe that manufacturers and suppliers belong together. We would therefore very much welcome another large, combined trade show sometime soon. 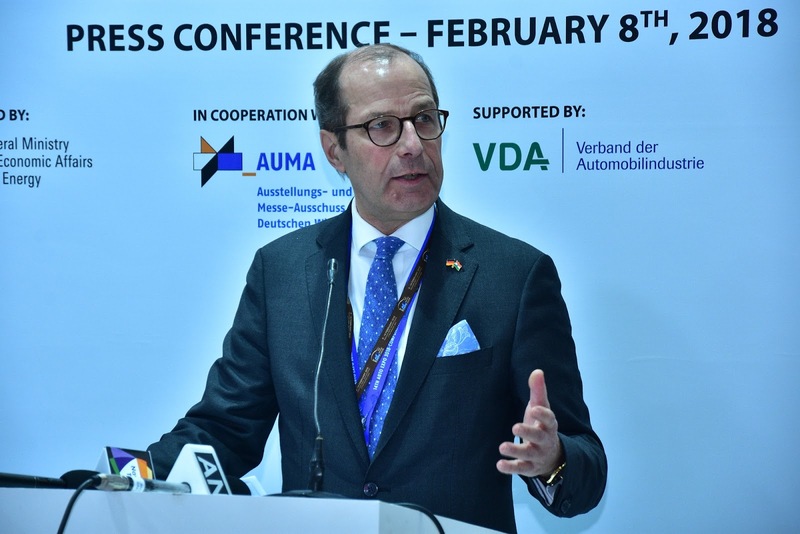 VDA is organizing a range of activities to support the presence of the German automotive industry in India. One important activity is the meeting of our “Indo-German Working Group on Automotive” this week. It comprises representatives of the Indian and German Governments, important automotive institutions, and the trade associations ACMA, SIAM and VDA. It covers topics that are key to mobility and the automotive sectors in both countries, such as the environment, safety and alternative powertrains, all the way to the regulatory conditions for bilateral trade. We regard this platform as very valuable and wish to thank all those involved for their support. The Indo-German Working Group was formed in 2007. It therefore has a long and continuous history and has made major contributions to building trust and transparency in our bilateral relations. Its next meeting will take place in Greater Noida on February 9, 2018. We wish to thank in particular the German Federal Ministry of Transport and Digital Infrastructure for supplying active support to this group. Also, recently VDA has initiated a new activity that continues the development of our Indo-German relations. 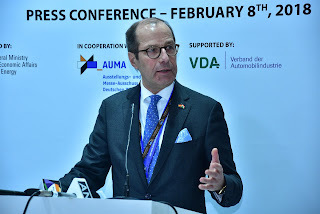 Since last year, with support from the German Federal Ministry for Economic Cooperation and Development (BMZ), we have managed to launch an association partnership program between ACMA, SIAM and the VDA. At the heart of this partnership are further steps to even closer cooperation in various areas of mutual interest, such as climate protection policy, quality management, and trade shows. A firmly established event in Germany is the “IAA India Day” that is held regularly at the IAA with the participation of our Indian partners ACMA and SIAM and the Indo-German Chamber of Commerce (IGCC). This year, too, we would like to invite you to the IAA – the leading international trade show organized by the VDA. In 2018 it is the IAA Commercial Vehicles, and it will take place in Hannover from September 20 to 27. Last year (Jan. to Nov.) German suppliers delivered parts and components worth 514 million euros to the Indian market. In return, Indian suppliers exported parts worth 205 million euros from India to Germany. If we look at Indo-German automotive trade in its entirety – that is, taking vehicles and motor-vehicle parts together – we find that Germany has a trade surplus of around 234 million euros (from Jan. to Nov. 2017). “However, obviously too little attention is given to the fact that the Indian automotive industry has a surplus in the trade in passenger cars with Germany: whereas in the first eleven months of 2017 passenger cars worth only 30 million euros were sold from Germany to India, India supplied passenger cars worth 240 million euros to Germany. That clearly demonstrates the India high level of competitiveness. I am therefore very keen to see the negotiations on a free trade agreement between EU and India resumed soon. To date they have not come to fruition and are more or less on hold. From the outset, the VDA has worked for the complete removal of import duties in the automotive sector – even if this is associated with longer transition periods. So far the Indian Government has not ruled out this position; and in fact its passenger car trade surplus should facilitate such a move. This would also be in India’s own interest, because this large, aspiring country also wishes to increase its own exports. For this, free access to the international markets will be absolutely essential – also for India. This is true of the markets around the world: stable direct investments and free trade are two sides of the same coin and integral aspects of sustainable business to everyone’s mutual benefit. Therefore, this week we are also encouraging our partners to ensure that the Indian industry will actively support the free trade agreement with the EU as soon as the negotiations start up again. The good news is that for the Indian and German suppliers there is still more potential for expanding bilateral trade and investments. It will pay off to leverage this potential. For this reason our companies are here, and for this reason they support these goals”, concluded Braunig. - Their commitment to both sides of this coin: together they stand for trade with India and investments from Germany.